This adorable turkey is trotting out to help wish someone a "gobble, gobble, great" Thanksgiving! Dressed in a pilgrim hat, he adds an extra touch of whimsy to this already charming Thanksgiving card, which is perfect for sending to anyone. We can guarantee they'll be smiling when they see it, knowing you took the time to share a fun holiday greeting with them. 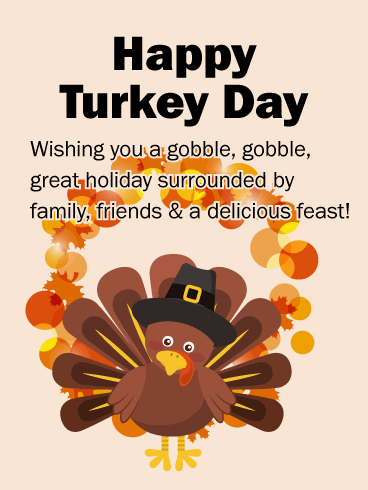 Happy Turkey Day - Wishing you a gobble, gobble, great holiday surrounded by family, friends & a delicious feast! When was the last time you sat down and gave thanks for all of the good things in your life? 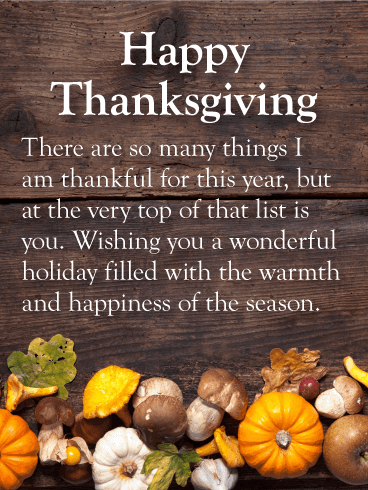 As the holidays approach, use this Thanksgiving card to share your appreciation for everything you love about your life. Send it to your friends and family to celebrate this special day and to thank them for always being by your side. Ah, fall. Temperatures cool, leaves change color, and the approaching holiday season quickly brings excitement and anticipation to the world. 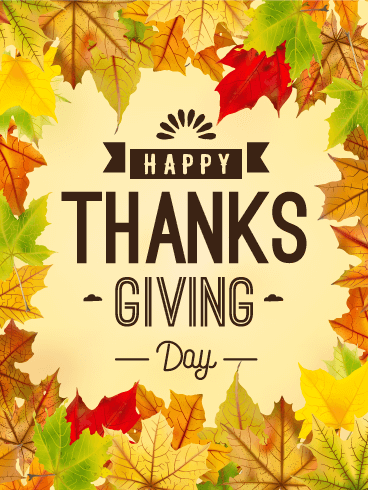 As the end of November draws near, celebrate a Day of Thanksgiving by sharing your appreciation for everything you hold dear. 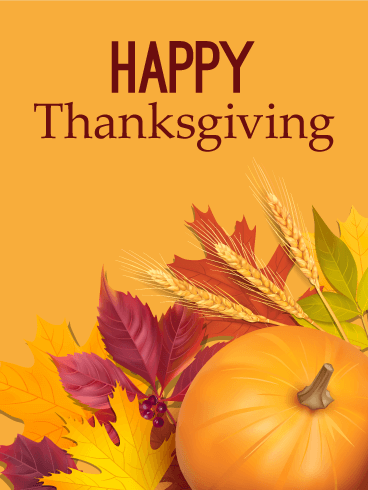 Send this beautiful Thanksgiving card to the people you love most and use it to mark this holiday today! Every November, Americans gather together to feast and celebrate with family, parades, and good ol'American football. As Thanksgiving comes this year, use the holiday to sit back and appreciate the best things in life. 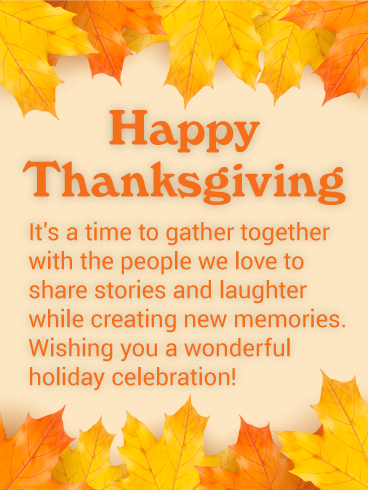 Send this Thanksgiving card to share your celebrations and affections with the people you love best. Make this a holiday celebration that no one will ever forget! There's no better way to celebrate fall and Thanksgiving than with a giant, orange pumpkin! 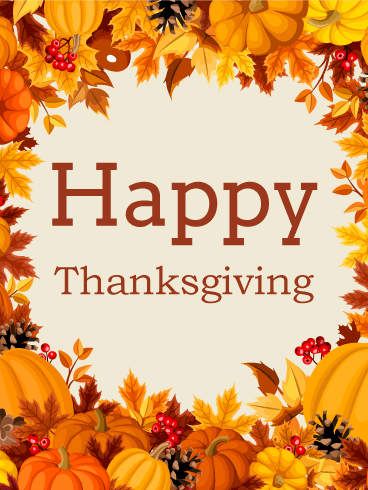 As this beloved holiday approaches, take some time to reflect on the things you are thankful for. Gather your friends and family members to appreciate the importance of love and relationships. 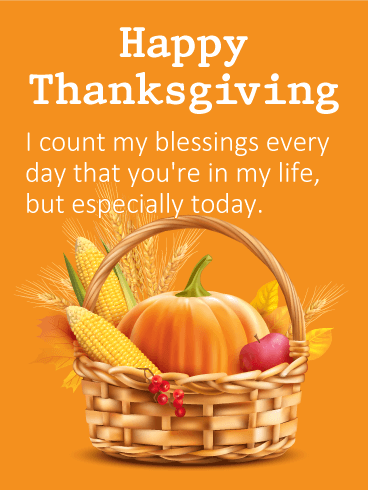 Send this Thanksgiving card to show how thankful you are during the holiday this year! The basket below holds the rich bounty of the harvest season. The message above holds your thoughtful words to someone you care about. 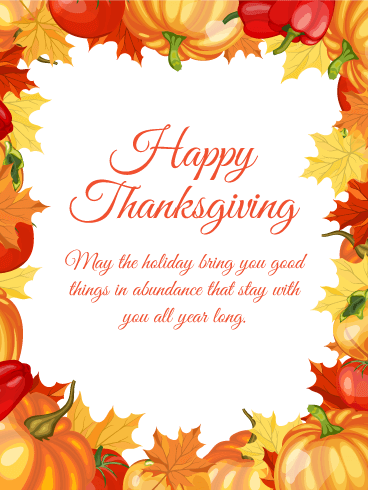 On this special holiday, where we give thanks for so many things, you want them to know that you count them as one of your many blessings in life, not just on this one day, but every day. It's a beautiful sentiment sure to touch their heart for years to come. Red, orange, and yellow are the colors of autumn and round, shiny pumpkins are a sign of the good things this season has to offer. As Thanksgiving approaches, use this Thanksgiving card to celebrate all of your favorite things about fall. Share your appreciation for your relationships and the good things you get to enjoy. 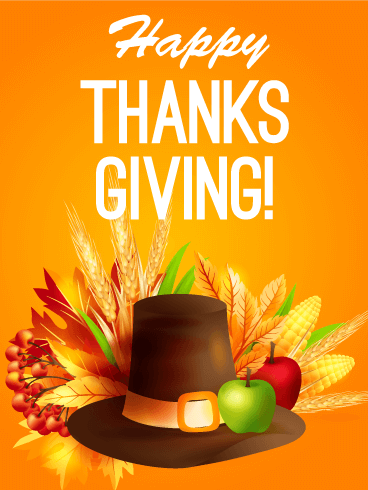 Use this Thanksgiving card to make this a Thanksgiving your loved ones will always remember! Do you like to decorate your home for autumn and Thanksgiving? Pumpkins, autumn leaves, scarecrows, Pilgrims, ears of corn, and more bring a special holiday feel to your home and family. 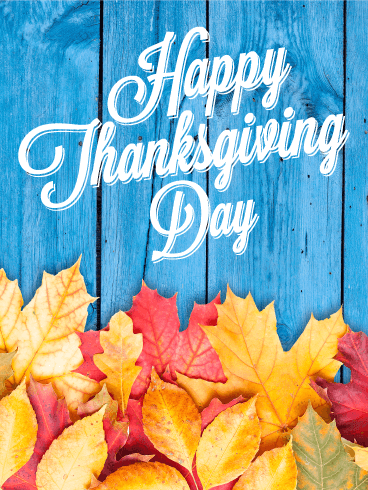 As you get ready to gather with your loved ones to celebrate, eat, and give thanks, send this Thanksgiving card to commemorate this special occasion and spread the holiday cheer! Golden yellow and rich orange leaves surround a beautiful Thanksgiving wish for the people you love most. It's a reminder of what the holiday is all about: coming together with family and friends to share in a delicious meal while enjoying each other's company. 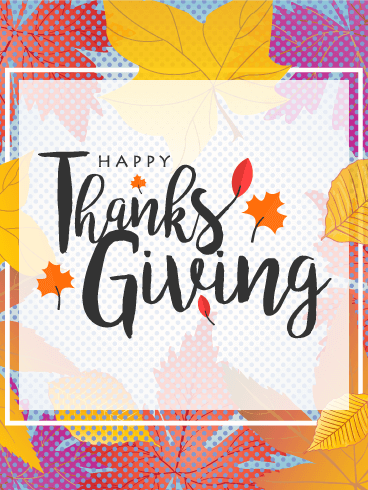 From the conversation and tradition to the new memories created, help make this year special with a heartfelt Thanksgiving card to let them know you're thinking of them. A rustic wood table backdrop is filled with the season's most colorful harvest of pumpkins, gourds and apples. It's the perfect setting for your Thanksgiving wishes to someone very special. It's a chance to remind them that of all the things you have to be thankful for this year, they are "at the very top of that list." What a thoughtful sentiment that’s sure to stay with them all throughout the year. 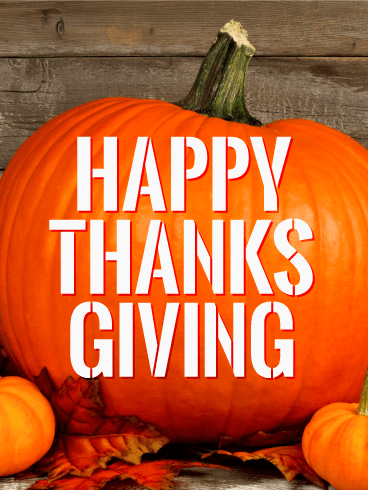 Every year at the end of November, people across the U.S. gather to celebrate Thanksgiving Day. From large parades to delicious home cooking and special family gatherings, this holiday is about celebrating what we have and sharing it with the people we love most. 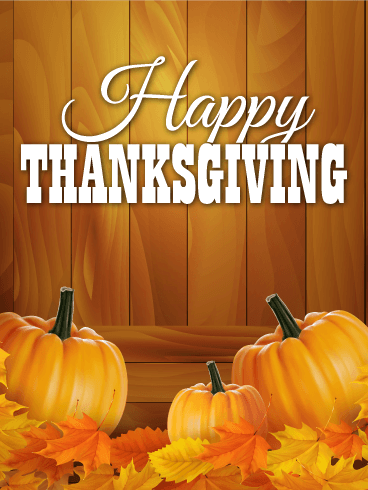 To make the most of this special day, send this Thanksgiving card to your friends and family to wish them a "Happy Thanksgiving Day"!